Why treat hypoglycemia with 10% dextrose (D10), rather than the more expensive, potentially more harmful, and less available, but traditional treatment of 50% dextrose (D50)? Why not? The only benefit of 50% dextrose appears to be that it is what people are used to using, but aren’t we used to starting IVs (IntraVenous lines) and running fluids through the IVs? We should be much more familiar with running in fluid, than in pushing boluses of syrup. What happens when we have temporary shortages of 50% dextrose? Do we stop treating hypoglycemia? Are we supposed to panic, because we can no longer follow tradition? No. We give the more appropriate, and lower, dose of the much lower concentration of dextrose. We provide better care because of our need. Despite the traditional use of D50, there is a minimal amount of data to support it as the standard of care. Is 10% dextrose the perfect treatment for hypoglycemia? No, but it does appear to be less likely to cause harm than the current overtreatment with 50% dextrose. Seven patients had a drop in blood glucose after D10 administration, all of 10 mg/dL or less except for one patient with a drop of 19 mg/dL who had an insulin pump infusing that was not removed by EMS personnel during D10 infusion. Is that any different from what happens with 50% dextrose? If this is different from D50, how does the potential harm from giving too much dextrose to most hypoglycemic patients compare to the potential harm of giving a first that is too small to fewer than 1% of hypoglycemia patients? There were no reported adverse events related to dextrose infusion. Six patients who received intravenous D10 were pronounced dead in the field during the period of study. On investigator review, all patients had altered level of arousal or were in cardiac arrest prior to arrival of EMS personnel and their deaths were deemed to be unrelated to dextrose administration. Dextrose does not reverse death, so there is no reason to expect a better outcome for dead patients with a higher concentration of a drug that does not reverse death. Go read the excellent review of the evidence on hypoglycemia, death, and the potential of dextrose to improve outcomes from death. But is 10% really better? We don’t have any good research, but is there any good reason to give all 25 grams of dextrose in a syringe of 50% dextrose if the patient wakes up before the full dose has been administered? Would we continue to give the entire syringe of morphine, or fentanyl, or most of the other drugs that we give, if our assessment shows that the patient no longer meets the protocol criteria for administration of the drug? 76% of patients received only 10 grams of dextrose, rather than the usual 25 grams. While it is not known if any of these patients required any further dextrose, or oral glucose, while in the hospital, they should have been awake enough to take any further dextrose orally, as they would the rest of the time. 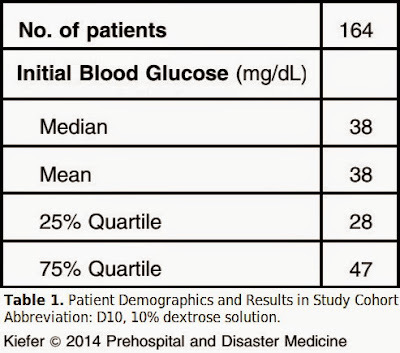 23% of patients received only 20 grams of dextrose, rather than the usual 25 grams. Fewer than 1% of hypoglycemia patients received a dose as large as we traditionally give. We do not appear to be concerned with harm from administering more aggressive treatment than is justified by the evidence. We do appear to be concerned about our anxiety of deviating from the traditional too much is not enough approach to hypoglycemia. 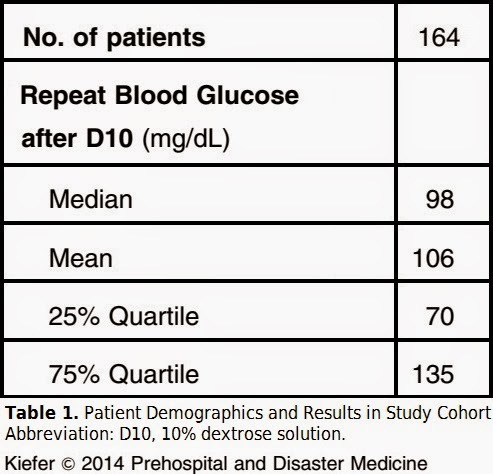 D10 in the Treatment of Prehospital Hypoglycemia: A 24 Month Observational Cohort Study. Hern HG, Kiefer M, Louie D, Barger J, Alter HJ. Prehosp Emerg Care. 2017 Jan-Feb;21(1):63-67. doi: 10.1080/10903127.2016.1189637. Epub 2016 Dec 5. Of the 1,323 patients administered D10 during the study period, the 452 patients excluded from the study cohort for the aforementioned reasons were similar demographically to the study cohort. The median initial blood glucose was the same at 37 mg/dL and the median age was also 66. There were slightly more women at 229 (51%) in the excluded group compared to the cohort. Should we treat hypoglycemia in a dead person? How do we determine hypoglycemia in a dead person? Is there any evidence that giving dextrose, in any concentration, will help to resuscitate a dead person? Should we treat patients based on the philosophy of Who knows? Maybe it could work? Bleach enemas are currently in fashion among the alternative to medicine crowd, so we could use the same reasoning to give bleach enemas in cardiac arrest. Who knows? Maybe it could work. Is Kitchen Sink Medicine significantly different from any other alternative to medicine? The dead person is dead, so we have to do something. 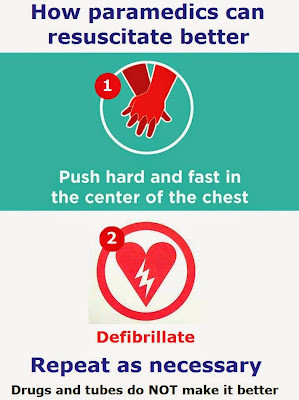 We do compressions and (when indicated) defibrillation, because those are the only treatments that have been demonstrated to work. 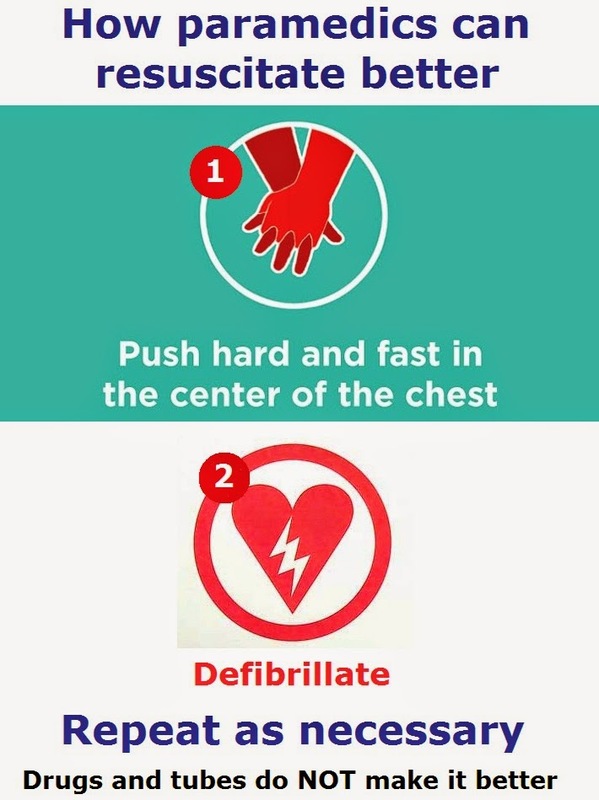 Ventilations are only a part of high-quality CPR for children and people who have a respiratory cause of cardiac arrest. But what about dextrose for hypoglycemic cardiac arrest? We may already be raising the blood sugar with epinephrine. Epinephrine causes a prompt increase in blood glucose concentration in the postabsorptive state. This effect is mediated by a transient increase in hepatic glucose production and an inhibition of glucose disposal by insulin-dependent tissues. We seem to have trouble understanding that dead people do not respond to treatments the same way that living people do. Pharmacologic insults are just so massive and normal metabolism and physiology so deranged that no mere mortal can make a meaningful intervention. The seriously poisoned who maintain vital signs in the ED have the best, albeit never guaranteed, chance of rescue from a modicum of antidotes and intensive supportive care. Maybe we should find out what we are doing and not blindly throw kitchen sinks at dead people based on hunches. Dr. Brooks Walsh gave a good review of the evidence in his article written three years ago. What about my original questions? There is no evidence that giving dextrose is safe or effective for any cardiac arrest patients. We guess or check a capillary blood sugar, which is not reliable. Is there any evidence that giving dextrose, in any concentration, resuscitates a dead person? Go read Using Dextrose in Cardiac Arrest at Mill Hill Ave Command. Cardiocerebral Resuscitation: An Approach to Improving Survival of Patients With Primary Cardiac Arrest. Acad Emerg Med. 2010 Mar;17(3):269-75. Effect of epinephrine on glucose metabolism in humans: contribution of the liver. Am J Physiol. 1984 Aug;247(2 Pt 1):E157-65. Furthermore, extravasation can cause necrosis. I expect juries to look at this kind of image and say, Somebody has to take one for the 50% dextrose team. We can’t expect EMS to change. Won’t giving less concentrated dextrose delay treatment? The median initial field blood glucose was 38 mg/dL (IQR = 28 mg/dL – 47 mg/dL), with subsequent blood glucose median of 98 mg/dL (IQR = 70 mg/dL – 135 mg/dL). Elapsed time after D10 administration before recheck was not uniform, with a median time to recheck of eight minutes (IQR = 5 minutes – 12 minutes). If that is going to slow your system down, is it because you are transporting patients before they wake up? Did anyone require more than 10 grams of 10% dextrose, as opposed to 25 grams of 50% dextrose? 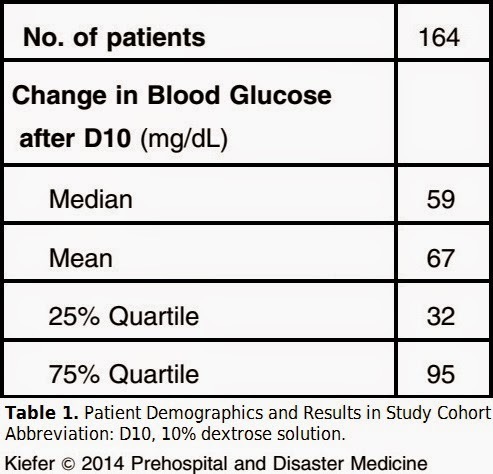 Of 164 patients, 29 (18%) received an additional dose of intravenous D10 solution in the field due to persistent or recurrent hypoglycemia, and one patient required a third dose. 18% received a second dose, which is 20 grams of dextrose and still less than the total dose of 25 grams of dextrose given according to EMS protocols that still use 50% dextrose. Only one patient, out of 164 patients, required a third dose. That is 30 grams of dextrose. Only one patient, out of 164 patients, received as much as we would give according to the typical EMS protocol, which should be a thing of the past. If we are routinely giving too much to our patients, is that a good thing? Why? Maybe the blood sugars were not that low to begin with. The average was 38 mg/dL, which is not high. Maybe the change in blood sugar was small after just 10 grams of dextrose, rather than 25 grams. The average (mean) change was 67 mg/dL, which is enough to get a patient with a blood sugar of 3 up to 70. Maybe the blood sugar was not high enough after just 10 grams of dextrose, rather than 25 grams. The average (mean) repeat blood sugar was 106 mg/dL, which is more than enough. Maybe it took a long time to treat patients this way. The average (mean) time was 9 minutes, which is not a lot of time. 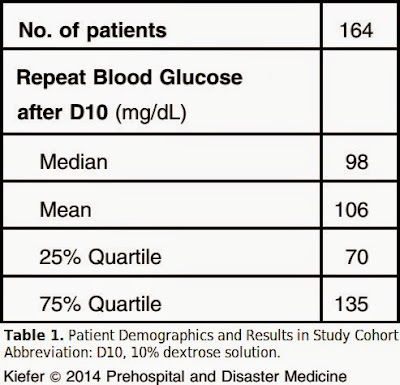 Three patients had a drop in blood glucose after D10 administration: one patient had a drop of 1 mg/dL; one patient had a drop of 10 mg/dL; and one patient had a drop of 19 mg/dL. All patients, even the three with initial drops in blood sugar (one had an insulin pump still pumping while being treated) had normal blood sugars at the end of EMS contact. 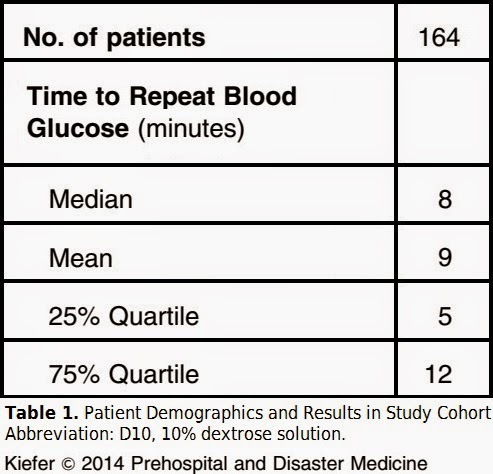 10% dextrose is cheaper, just as fast, probably less likely to cause hyperglycemia, probably less likely to cause rebound hypoglycemia, probably less likely to cause problems with extravasation, less of a problem with drug shortages, . . . .
Why are we still resisting switching to 10% dextrose? Other articles on 10% dextrose. Dextrose 10% in the treatment of out-of-hospital hypoglycemia. Kiefer MV, Gene Hern H, Alter HJ, Barger JB. Prehosp Disaster Med. 2014 Apr;29(2):190-4. doi: 10.1017/S1049023X14000284. Epub 2014 Apr 15. Images in emergency medicine. 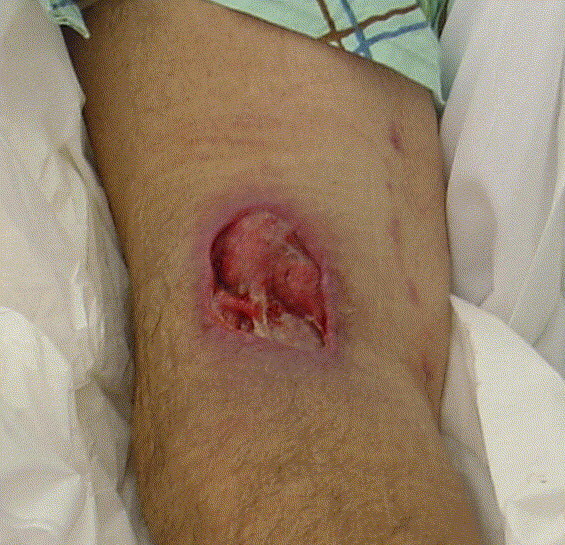 Dextrose extravasation causing skin necrosis. Ann Emerg Med. 2006 Sep;48(3):236, 239. Epub 2006 Feb 17. No abstract available. Maryland made smart changes to their protocols because of the drug shortages. Switching to 10% dextrose is an obvious solution, but not used by everyone. Sedgwick County EMS workers administer about 80 doses of the stuff (50% dextrose) a month, but the county has only received 30 pre-filled doses so far this year through its normal vendor, Braithwaite said. We have research that shows that 10% dextrose is a better choice for EMS, but we continue to use the inferior treatment. We have trouble obtaining the inferior treatment, but we refuse to change to the better treatment. Is there a state law that prevents the use of different concentrations of dextrose? If so, go to the government, explain the problem, and get the law changed. If that does not work, go to the press and point out that the failure to act by the legislature is endangering patients. “We’re now looking at compounding of those medications,” he said. But that’s an expensive alternative. A pre-filled dose of dextrose costs $6.99. A vial costs $1.81. Pre-filled doses are preferred, Hadley said, because there is one less step for emergency personnel. Compound dextrose costs $14 per dose and has a much shorter shelf life, 90 days compared with two years. 50 ml of 50% dextrose contains 25 grams of dextrose. A 250 ml bag of 10% dextrose contains 25 grams of dextrose. The cost of the bag of 10% dextrose is about $2.50, which is much less than the $7 cost of and amp of 50% dextrose. Is there a difference in shelf life? If they are giving 80 doses a month, how much does that matter? The only advantage to the 50% dextrose is familiarity, which is due to our failure to change to a better treatment when it becomes the right thing to do. The drug shortages do not affect 10% dextrose. Isn’t it time we cut costs, improved safety, improved care, and eliminated 50% dextrose? Emerg Med J. 2005 Jul;22(7):512-5. Continuing from Part I, where our excited delirium patient was sedated quickly with IM (IntraMuscular) ketamine, but developed laryngospasm and cyanosis later at the hospital. Actually, not remotely All better! After several minutes, the patient again developed hypoxia, airway obstruction, and spasms of the larynx. Do we have a good drug to prevent laryngospasm? Can we ventilate him again? Yes, but there is a bit of a pattern developing. It would not be good to ignore the possibility that there may be more episodes of laryngospasm for this patient today. Positive-pressure ventilation was again able to overcome the obstruction; however, given the recurrent nature of the laryngospasm, the trachea was intubated after the administration of succinycholine. No recreational drugs were found on the drug screen, but he did have an alcohol level of 220 (0.22 mg/dL). It is a mistake to think that excited delirium is always about illegal drugs. No cocaine, no amphetamines, no PCP, not even bath salts. Just good old legal alcohol. Not even a huge dose of alcohol, but in that sweet spot between clearly drunk and unable to protect his own airway. 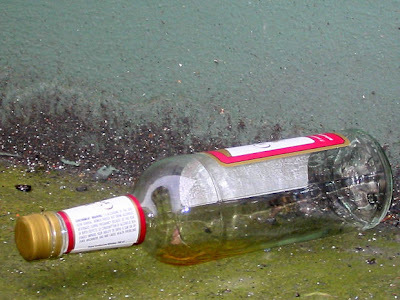 How much of the alcohol did he burn off in the fight with police before the alcohol level was obtained? Given the recurrent nature of the larygnospasm, our patient was ultimately intubated to decrease the risk of respiratory arrest during transport out of the ED for head CT. In contrast, during EMS transport, patients are not separated from the EMS provider until care is transferred at the receiving ED. The constant attendance to the patient by EMS providers allows for immediate and, if necessary, repeated assisted ventilation. Restricting ketamine to EMS units capable of rapid-sequence intubation therefore seems unnecessary. It is nice to see people acknowledge this difference between EMS and in-hospital care. With competent EMS personnel, we are almost never more than arm’s length away from the patient. A failure to recognize a problem with respirations is rarely possible with competent personnel. We should also never be allowed to intubate until after we have demonstrated competence with a BVM (Bag Valve Mask) and we should maintain that competence. Regular experience is important. Providers should be educated to vigilantly monitor for hypoventilation. The use of end-tidal carbon dioxide measurement and pulse oximetry should be routine. All of the people in EMS complaining about not wanting to get in trouble should be using the EtCO2 (waveform capnography) and the SpO2 (pulse oximetry) to record that the patient is breathing adequately. By attaching printouts to our charts, we should be providing ourselves with great documentation of the patient’s breathing. If these are available and we don’t record EtCO2 and the SpO2, then we provide good evidence that we do not know how to manage respiratory depression. If we cannot manage respiratory depression, we should not be allowed to treat emergency patients. Administration of ketamine to a patient in excited delirium allows EMS providers to rapidly perform lifesaving interventions, including vital sign assessment, cardiac monitoring, volume resuscitation, oxygen therapy, blood glucose determination, and medication administration. Is it acceptable to do blood glucose determination after ketamine? Of course it is. 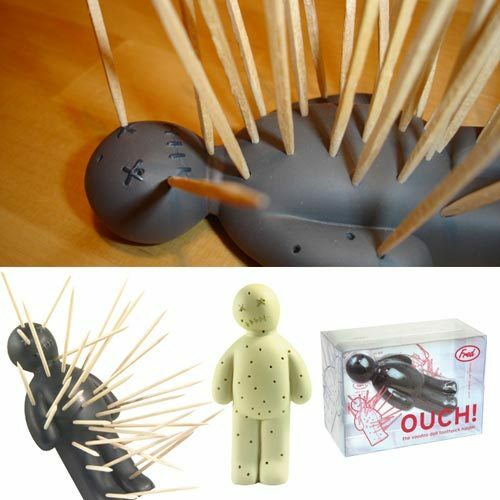 Why use more needles than necessary when wrestling with a patient? If the patient is a known diabetic, but is combative, is it really a good idea to try to administer hyperosmolar solutions (such as D50W – 50% Dextrose in Water) through an IV to that combative patient? Not that there is any good reason for us to still be using stronger than 10% dextrose to reverse hypoglycemia. Is there a better drug than ketamine for managing the violence of excited delirium? To be continued in Part III. I used to have protocols that insisted that thiamine (Vitamin B1) be given before glucose. Prolonged thiamine deﬁciency can lead to the development of Korsakoff syndrome, characterized by permanent mental impairment with confabulation and memory deﬁcits. Maybe that explains how the requirement for thiamine before glucose came about – confabulation. Many of our traditional treatments are better explained by narrative fallacy confabulation, based on a persuasive hypothesis, than by any evidence of benefit to the patient. in starvation, when glucose stores are depleted, the brain suffers most acutely as it relies almost entirely on glucose for energy and there is little thiamine available to act as cofactor for the conversion of any small amount of remaining glucose to ATP. How should that affect patient care? Reference 10 is the 6th edition (2004) of the Emergency Medicine Manual by Tintinalli. Something that would be accepted as an authoritative reference by many people. The 19 articles reviewed included expert opinion (n = 2), case reports (n = 13), and animal models (n = 4). In other words – nothing. They found an old expired expert opinion, some case reports that should generate some hypotheses for research, and some animal models that also should generate some hypotheses for further research, but nothing that should be the basis of treatment of humans. Old McDonald would be thrilled. Incidentally, there is evidence that thiamine is taken up and utilized by cells significantly more slowly than is glucose, taking away even a theoretical justification for the thiamine-before-glucose canard. Dr. Leon Gussow writes The Poison Review and has reviewed this paper. He provides a lot of useful information in his original paper from 5 years ago. The most often cited source claiming a link between glucose loading and acute onset of Wernicke encephalopathy in thiamine-deﬁcient patients is a four-case series by Watson et al. from 1981 (9). However, as pointed out by Hack and Hoffman in 1998, none of these cases involved the acute administration of glucose (20). The most often cited source – only four patients – and none of them received the treatment being referenced. Do any of these people read the paper before citing it? Do any of these people understand the difference between giving a treatment and not giving a treatment? Maybe there are valid reasons for citing a paper that is completely irrelevant. All other cases clearly showed deterioration in mental status after prolonged or massive (>2 L of 5%) glucose infusion, or showed evidence of Wernicke encephalopathy before glucose administration. >2 L of 5% glucose is more than four 50 ml ampules of D50W (Dextrose 50% in Water). I have never given close to that much to any one patient. So although the evidence does not support rapid deterioration after glucose administration, it likewise does not seem to support the lack of rapid deterioration. Because we are in a largely evidence-free zone. We can make all sorts of claims – as long as we do not expect to use any good evidence to support these claims. Since we are not using evidence, we should ignore the following suggestion from the authors. Where is there any evidence that 50% dextrose is any better than an infusion of 10% dextrose? After demonstrating the lack of evidence supporting one tradition, they blithely encourage adherence to a different tradition. There is no good reason for us to be giving such hyperosmolar fluids peripherally. If we are going to use a peripheral line, we should be using a much more dilute form of dextrose. The total amount of dextrose administered will be significantly less. The risk of extravasation will be less. The cost will be less. The treatment time will not be different. 10% dextrose is a much better idea than 50% dextrose. Both the median total dose of dextrose administered and post-treatment blood sugar level were significantly higher in the 50% group, and these subjects were more likely to have received the maximum permitted dose of 25 g (table 2). Equal benefit with 10% dextrose, but less likelihood of harm. We continue to use 50% dextrose because . . . ? Two of the subjects contacted by the researchers after treatment reported that before the study they had often had difficulty bringing their blood glucose back to their expected usual level after being treated by paramedics using 50% dextrose. We need to question more of our traditional treatments. Thanks to Christopher Watford of EMS 12 Lead and My Variables Only Have 6 Letters for bringing this to my attention. Glucose before Thiamine for Wernicke Encephalopathy: A Literature Review. J Emerg Med. 2012 Apr;42(4):488-94. Epub 2011 Nov 21. Myths and misconceptions of Wernicke’s encephalopathy: what every emergency physician should know. Donnino MW, Vega J, Miller J, Walsh M.
Ann Emerg Med. 2007 Dec;50(6):715-21. Epub 2007 Aug 3. Review. Is the treatment in the video (at the end) that much different from these myths? Real medics/nurses/doctors do not need Waveform Capnography to confirm tube placement. Prehospital treatments are effective at warming up hypothermic patients. We should delay arrival of the patient at the trauma center, just so that the patient can arrive by helicopter. Naloxone (Narcan) is harmless and it helps to identify heroin overdoses. 2 mg of morphine is pain management in otherwise health adults. Physically restraining, but not sedating agitated patients is patient care that should not result in a malpractice suit, and maybe criminal charges against the medical director and the medics. Lasix (furosemide/frusemide) should be used by EMS. 50% dextrose is as good as 10% dextrose. OLMC (On Line Medical Command requirements) protect patients. Spinal immobilization protects against disability from spinal injuries. Mandatory CISM (Critical Incident Stress Management) is good. Triage based only on Mechanism Of Injury works. Sodium Bicarbonate is the first drug for hyperkalemia. Sodium Bicarbonate is the first drug for acidosis. More than 3 nitro is too much. If it wheezes it is asthma. If it crackles it is heart failure. The Golden Hour is not a hoax. Is any of that EMS quackery really different from the quackery portrayed in the video? h/t Respectful Insolence for the video. Also posted over at Paramedicine 101 (now at EMS Blogs) and at Research Blogging. On the EMS Research Podcast Harry Mueller, Dr. Bill Toon, and I discuss this paper. Go listen to the podcast. 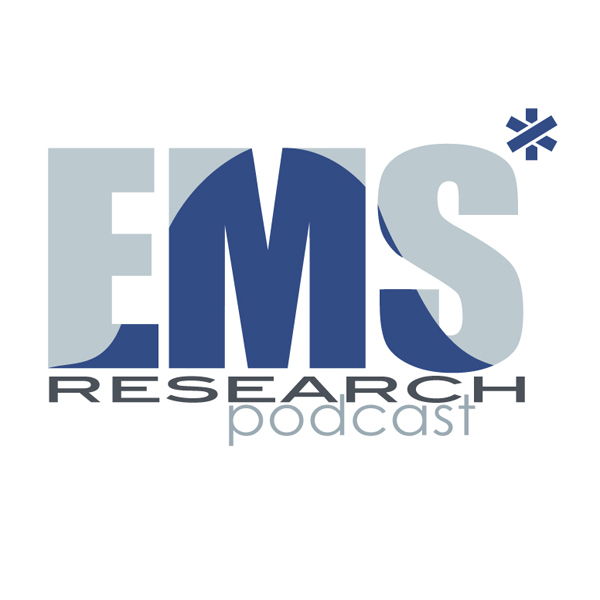 Dextrose 10% or 50%: EMS Research Episode 10. 1. Is 50% dextrose as safe as 10% dextrose? 1 a. Can cautious administration eliminate that difference in safety? 2. Is 50% dextrose as efficacious as 10% dextrose? 3. Is 50% dextrose as affordable as 10% dextrose? Out of 3 criteria, 50% dextrose fails two of the criteria. If 10% dextrose is cheaper and it is safer to switch to 10% dextrose, why do so many of us in EMS resist this simple change? While this may indicate idiosyncratic responses, there is no mention of any similar negative responses to 10% dextrose. this might require a larger study to examine, but this is a great start. The picture is one I found labeled as being from Annals of Emergency Medicine of 50% Dextrose extravasation, but I do not know anything about which issue it is from or any other details. Issue information. Go listen to the podcast..
A review of the research on this topic, which is predominantly about the above paper.